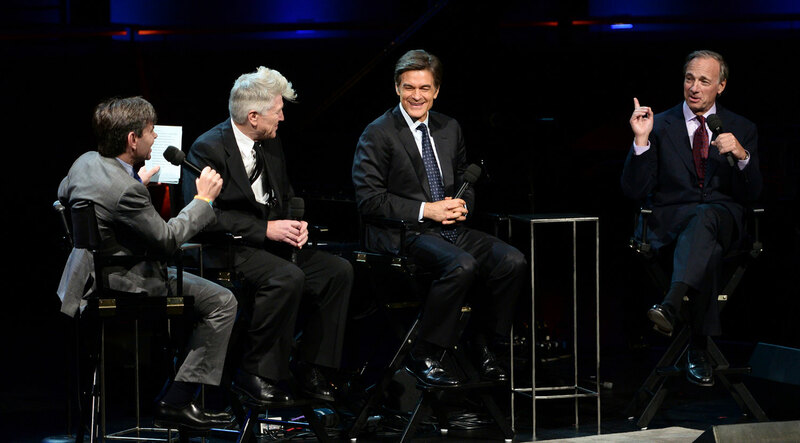 The David Lynch Foundation celebrated the successes of the past year at “An Historic Night of Jazz”–its fourth annual Change Begins Within benefit gala–held at Jazz at Lincoln Center in New York City. The evening featured world-class jazz performances and inspiring stories of transformation from first responders, survivors of domestic violence, and children on the autistic spectrum. Musicians included Corinne Bailey Rae, Esperanza Spalding and Terri Lyne Carrington alongside jazz legends Herbie Hancock, Wynton Marsalis, and Wayne Shorter. During the evening, the Foundation honored Dr. Mehmet and Lisa Oz with the DLF’s “Perfect Health Award” and Ray and Barbara Dalio with the DLF’s “Unbounded Generosity Award” for their unmatched lifetime achievements in the fields of health and finance and philanthropy—and for their generous support of the DLF’s work with adults and children in need. Sixteen-year-old Joey Lowenstein, who is on the autism spectrum, received the DLF’s “Resolute Courage Award” for triumphing over overwhelming personal setbacks and starting the Joey Lowenstein Foundation to aid children with autism, including providing them with TM instruction. Donations from the benefit gala helped the Foundation begin to deploy a team of young professional instructors who will bring Transcendental Meditation to thousands of inner-city students, veterans, and women and girls in the New York City Tri-State area during 2013.